Why Should I care about BIM? by Alan Johnston, President - Hydratec Inc.
Building Information Modelling (BIM) and 3 dimensional (3D) are both terms that have floated around our industry for quite some time now. When I finished the CAD design and coordination of the Boston Garden (currently called the TD Garden) I recall the project manager predicting that the next project would be coordinated in 3D. So the idea of 3D CAD has been around for well over 20 years. I will only approximate the popularity of the BIM concept at 10 years or so and explain shortly how very different the two concepts are. But in either case, many of us have been able to largely ignore the necessity of either. Others have found a gold mine in participating in both as they’ve evolved. Hydratec, as an industry leader in developing software to support the design of sprinkler systems has been heavily invested in assuring that their customers have full access to both of those technologies as the requirements for them evolve. That definition encompasses the entire life cycle of a building and how it benefits, most of all, the owner of the building. For that reason, the drive to promote that process comes from the owner and the architect and the experience at that level has been mostly positive and very forceful. 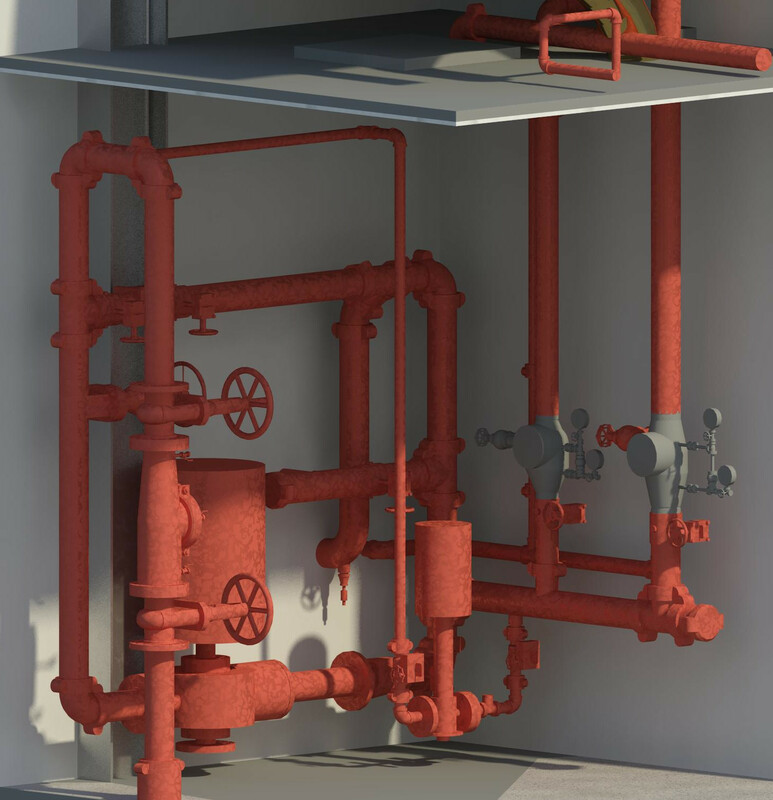 Fire Sprinkler Systems are admittedly one of the smallest components of a completed building (something in the order of 1% of the overall building cost) so it should be no surprise that the definition of BIM seems to have little specific reference to sprinkler systems. Likewise, the decision to use or ignore that process is not largely affected by the sprinkler industry even though one could argue that our industry participates in at least 3 out of 4 of the parts of my definition of the process, just in a small part quantitatively. The point is that we don’t have much to say about whether the BIM process is used or not on a project, only whether we will be a participant in that process, willing or not. All of the above ignores any reference to any branded software product because the terms are completely agnostic. However, if you’ve heard of BIM you have most likely heard of Revit. This is because Revit (an Autodesk branded product) has demonstrated itself to be the current de facto standard for BIM design software. I claim that there are at least three reasons why the management of a sprinkler contractor should care about BIM and their use of the Revit platform. You don’t want to get left behind. You want to be sure that your company stays relevant in a world where building owners, architects, engineers, contractors and subcontractors are all using that process and that software. This is actually true on certain projects or types of projects and very far off in the future for others. Hospital and school projects are likely applications for BIM and Revit while warehouses and small retail stores are less likely. As a manager you would certainly like to avoid being disqualified from successfully bidding on a large project because of your lack of technical ability but there are more and more projects that currently have bid requirements that depend on demonstrated ability in the BIM process. BIM capabilities can improve your marketing position. As the requirements for BIM participation evolve owners are becoming more aggressive in the demands for BIM and general contractors are likely to be more willing to expand their bid list to include your company over existing relationships if you can help them meeting those BIM demands. The ability of the sprinkler design to be fully integrated into the BIM model is already starting to become a discriminator in sprinkler contractor selection. You can better attract new talent! One of the challenges of our industry is to find more designers. The tools used in BIM design are decidedly more exciting and appealing than the existing design methods. Although this may be frightening to many experienced designers it can be a very effective draw for new talent. The 3D aspect of the BIM design process and the available representation of all of the other trades make BIM a much better learning environment for new designers because it is so much easier to visualize the interaction of the sprinkler design with the rest of the building. Here again, this benefit to you will vary based on the kind of work you typically do. All the other trades are all using that process and you are not. In many areas, geographical and project type that’s not true yet. But as it develops, that will be just plain embarrassing. In the meantime, the majority of projects developed by architects are already being defined in Revit and although you can still get AutoCAD backgrounds for those projects you are ignoring a wealth of critical information available to you from the Revit model. Improved productivity. 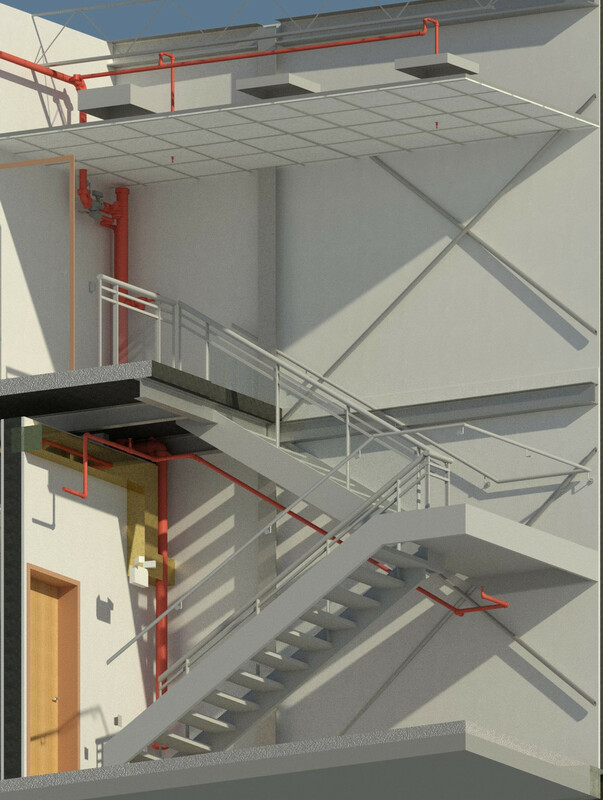 The BIM approach supplied by Revit provides an easy mechanism to see the model in any view helpful to the design so you can immediately identify the design constraints of your system. That same capability can make it easy to create multiple views of your design to describe your design intent. It’s just plain fun! Not everyone will agree with this statement because Revit is so much different from the familiar tools in AutoCAD. However, my experience is that the best designers all love a challenge and the fun is in both the improved results and the journey getting there. Knowing that 3D and BIM are increasingly becoming the norm in the industry, Hydratec has developed 3D/BIM compliant design, calculation, and listing software. 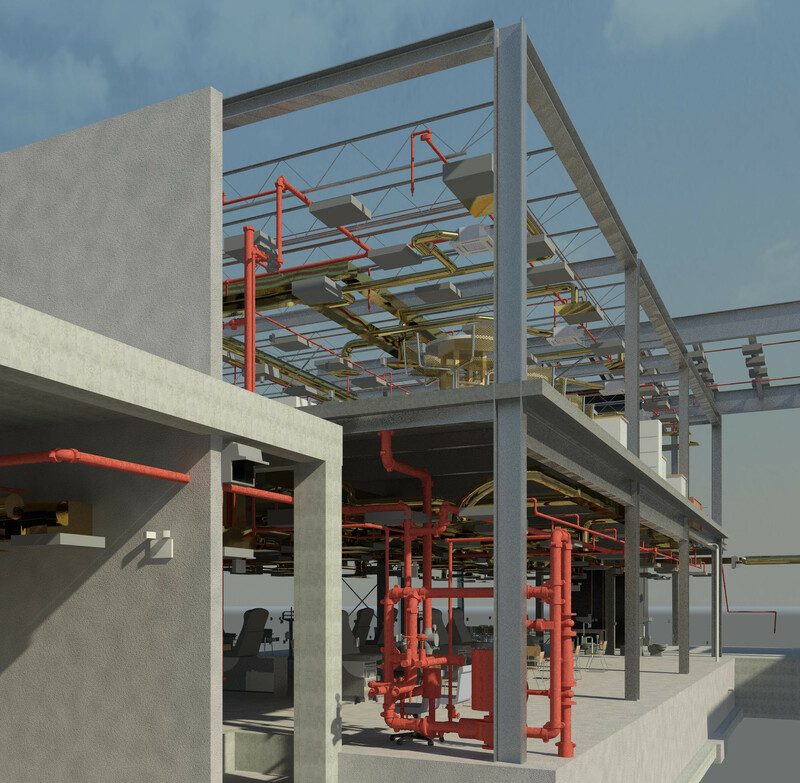 As Revit increasingly becomes the standard bearer for 3D/BIM compliant projects, Hydratec developed those tools as Revit embedded utilities, so that the Fire Sprinkler Systems developed using our software can be as much a part of the building model as the walls, duct work, and plumbing. The challenges faced by designers above hints at one of the pain points associated with the transition to Revit. To reduce the learning curve to be productive in a whole new program like Revit Hydratec has an on-line training course that will provide a ‘soup to nuts’ exposure to the entire process. Previous students of that course have reported the ability to be profitably productive on their 1st project while working on that concurrently with the training course project. That training is designed for users of Hydratec’s new complete set of Sprinkler Design Programs built entirely inside of Revit. More information about the Hydratec for Revit programs can be found on the HydraCAD.com website. For the less adventurous customers, Hydratec provides a function within the AutoCAD based design tools which will create a complete Revit Sprinkler model entirely from the traditionally designed sprinkler system. BIM and simple 3D drafting have already been a part of the sprinkler design landscape for a long time. As a technology evolution, BIM is as certain to replace 2D CAD as CAD was to replace the drafting board. Since Revit has already shown itself as the de facto standard for developing a BIM project, it is imperative that the sprinkler tools you use should function seamlessly within Revit. The most common type of work performed by your company will be the primary factor in determining the best time to make the switch to that new technology. Hydratec has shown itself to be fully committed to serving their customers throughout that transition regardless of the timing best suited to each customer.